“We will have a very strong (military) presence, very strong continued posture throughout the region to back our commitments to our allies, to protect and work with our partners and to continue ensuring peace and stability in the region, as well as back our diplomacy vis-à-vis China on the South China Sea”. -David Shear, US Department of Defense’s Assistant Secretary for Asian and Pacific Security Affairs. The highly influential Council on Foreign Relations recently published a Special Report entitled, “Revising US Grand Strategy toward China”, (Council on Foreign Relations Press: NY 2015), co-authored by two of its Senior Fellows, Robert Blackwill and Ashley Tellis (‘B and T’), which proposes a re-orientation of US policy toward China. The Report a policy for buttressing ‘US primacy in Asia’ and countering what they describe as “the dangers that China’s geo-economic and military power pose to US national interests in Asia and globally”. The Report concludes by listing seven recommendations that Washington should follow to re-assert regional primacy. This essay begins by discussing the basic fallacies underpinning the Report, including outdated and dangerous presumptions about US power and presence in Asia today, and the authors’ incoherent, contradictory and unrealistic prescriptions. Blackwill and Tellis (‘B and T’) start out with the preposterous claim that contemporary US policy toward China has been driven by its positive “effort to ‘integrate’ China into the liberal international order”. This is a gross misrepresentation of Washington’s past and current efforts to subvert the Chinese Communist government and to undermine its state- directed transition to capitalism. Ever since the end of the Second World War, and especially since the Chinese Civil War (1945-49), which brought the Chinese Communist Party to power, the US has poured billions of dollars in military aid to the retreating Nationalist regime and to finance the bloody Korean War (1950-53) – with the open goal of overthrowing the Chinese communist government. When US forces briefly reached the Chinese-Korean border, provoking a Chinese response, Washington threatened to unleash nuclear weapons on the Chinese. For the next two decades, the US maintained a naval and air embargo against the world’s most populous state, an insane policy which was only reversed by President Nixon’s re-establishment of diplomatic and commercial relations in 1973. When the veteran Chinese leader, Deng Xiaoping embarked on a state-managed transition to capitalism, Washington adopted a two-track policy of encouraging China’s rulers to ‘open their markets’ to US multi-national corporations, while financing and backing pro-US liberal activists seeking to overthrow the Communist government (the so-called Tiananmen Square Uprising) as well as the secessionist Tibetan and Uyghur insurgencies in western China. Far from trying “to integrate China into the liberal international order”, Washington attempted to replicate the decade-long chaotic and destructive “transition to capitalism” which took place with the dissolution of the USSR under Mikhail Gorbachev. During the disastrous US-backed regime of Russian President Boris Yeltsin – the ‘lost decade’ (1990-1999) – living standards for the average citizen plunged 70% and Russia was transformed from an advanced superpower to a ravaged vassal state. Beijing’s rulers took careful stock of the grotesque pillage of the former USSR and rejected US plans to replicate their ‘Russian success’ and integrate China as a vassal state within the international capitalist system. Washington’s sanctions and boycott policy, following the defeat of its Tiananmen Square proxies, was of no avail: Washington failed to stop the massive influx of US multinational corporations into China. Its punitive measures had no impact on China’s political stability and unprecedented economic growth. Washington’s policy supporting China’s entry into the World Trade Organization encouraged China to open up to US investors, but US policy makers did not understand how the Chinese state’s carefully calibrated mix of dependence on foreign capitalist investment and technology with their adoption, assimilation, and autonomous expansion of endogenous Chinese expertise would create a such a massive independent economic superpower. 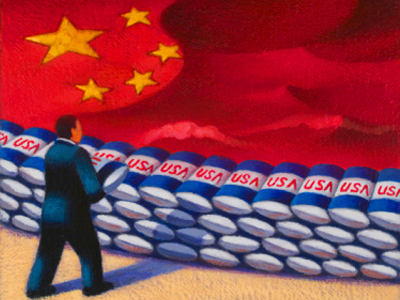 Washington’s ‘penetration and conquest strategy’, dubbed by B and S as its ‘integration into the international order’, ultimately failed, despite frequent attempts to undermine the Chinese state regulations and controls on foreign capital. The US’ efforts to subordinate (“integrate”) China into its burgeoning Asian empire was unsuccessful. During this period, China expanded into world markets, harnessing Western capital to its national goals. It borrowed and improved on US technology to develop a high growth model, exceeding the US growth rate by 600%! For over two decades, China grew exponentially, accumulating hundreds of billions of dollars in foreign reserves, while the US economy ran-up monstrous trade deficits with Beijing. The US had embarked on a series of prolonged wars while converting its economy from productive to finance capitalism and needed to borrow vast sums from China in the form of sales of Treasury notes or face a major domestic financial crisis. In essence (and not noted by ‘B and T’), China ‘integrated’ into the international economic order as a productive, creditor state, at the same time the US was reduced to financial–debtor status and lost its global economic primacy while pursuing its unpopular wars in the Middle East. It was not the ‘failure’ of liberal US market policies that propelled China forward to primacy in Asia, as ‘B and T’ argue in their essay, but Washington’s multi-trillion-dollar wars in South Asia, the Middle East and North Africa and its wholesale conversion to Wall Street speculation, which caused the US to lose its primacy in Asia. ‘B and T’s’ claim that US ‘market liberalism’ helped China to emerge as the economic superpower in Asia is a flimsy pretext for ignoring real causes and now promoting an even greater level of US militarism in the region. Unfortunately, their muddle-headed diagnoses and militarist proposals strongly influence the Obama Administrations policy decisions! Blackwill and Tellis’s unwillingness to recognize China’s peaceful rise to economic supremacy in Asia leads them to rely on a purely ideological construct to bolster their militaristic argument for intensifying “the US naval and air presence in the South and East China Seas and accelerating the US ballistic-missile defense (sic) posture” in the Pacific. ‘B and T’s a priori ideological presumptions lead them to declare that “China is a danger to US Asian interests”, ignoring elementary Chinese vital national interests in having open and secure access to vital waterways leading to their Asian markets and sources of raw materials. At no point does ‘B and T’ identify a single move implemented by China, which has threatened the open seaways. Nor do they identify a single overt or covert threat by China toward the US. While ‘B and T’ fantasize about China’s military threats, they suffer a severe case of amnesia with regard to overt US attacks, invasions, and occupations of China’s Asian neighbors. Over a dozen such military assaults have been launched by Washington in the region, which ‘B and T’ conveniently . . . omit. ‘B and T’s evocation of a “China threat” is a crude ploy to justify further US military encirclement of China, in line with their policy recommendations. The US has recently dispatched B-1 bombers and surveillance planes to Australia and threatens to attack China’s base and port construction on its off-shore shoals and island territories. Equally ominous, US officials arrested a visiting Chinese academic attending a conference claiming he was part of a plot stealing ‘dual purpose’ high tech secrets. B and T policy recommendations for securing US primacy in Asia are contradictory and incoherent. For example, they recommend that the US “revitalize the economy” and promote “robust growth” as a first priority, but then demand a “substantial increase” in the enormous US military budget. They advocate limits on the sale of civilian technology (so-called “dual” use) and the exclusion of China from US-sponsored Asian trade networks like the ‘Trans-Pacific Partnership’ (TPP). Most experts openly acknowledge that the huge US ten-trillion dollar military spending over the past two decades has destroyed any possibility for ‘robust growth’ of the US economy. ‘B and T’s recommendations for even more military spending can only make matters worse by diverting public and private capital away from economic growth. This is what undermines the United States strategic future in Asia! ‘B and T’ advise Washington “to expand Asian trade networks” . . . by excluding China . . . the largest investment site and market for the leading ‘500’ US multi-national corporations! In fact, when Obama, in line with ‘B and T’ recommendations, loudly refused to participate in the Chinese-sponsored ‘Asian Infrastructure Investment Bank, all of the US major Asian “partners”, except Japan, ignored Washington and joined the AIIB! China is unquestionably the leading economic partner for all Asian countries and none of the bellicose rhetoric that ‘B and T’ spout is going to erode those essential realities. In fact ‘B and T’s proposal to eliminate ongoing trade with China of so-called ‘dual purpose’ technological exports will further isolate the US from its much-ballyhooed ‘Asian partners’ who are especially eager to ‘add value’ to their exports. In sum, ‘B and T’s recommendations to US policy makers will guarantee an anemic, not a ‘robust’, growth. B and T proposals are guided by a strictly military logic, contrary to advancing US trade networks. B and T (and the Obama regime) propose “to reinforce” what they call the Indo-Pacific partnership via a “build-up (of) the power-political capabilities of its friends and allies on China’s periphery”. Whatever ‘B and T’ meant by “power-political capabilities” they certainly did not take into consideration India’s drive for economic development and long-term, large-scale investment and trade agreements. In terms of trade and development deals, the meager results on the heels of Obama’s recent visit to India demonstrate just how shallow the administration’s policy towards the subcontinent really is. The Indo-Chinese economic and development partnership far surpassed in size and scope any of the vacuous proposals put forth by ‘B and T’ to the Obama Administration. In mid-May 2015, Indian President Modi signed a $22 billion-dollar business deal with China on top of the massive $20-billion dollar Chinese infrastructure investment agreement in 2014. $42 billion-dollars of Chinese investment and trade deals with India have pulled the rug out from under any Obama regime plans to enlist India into its anti-China campaign and military provocations. The reality of Indian-Chinese economic deals shows just how absurd ‘B and T’ policy recommendations are. President Modi put the ‘nail’ in the coffin of ‘B and T’s, “US Grand Strategy toward China” in his last speech in China after his most successful visit: “I strongly believe that this century belongs to Asia”. Lest it be thought by any other Kissinger protégé, (Blackwill is a Henry Kissinger Senior Fellow), that the deepening Indo-China relation is a mere passing phenomenon, their agreements involve the most advanced sectors of their economies, including telecommunication and energy, as well as the development of a solar photovoltaic industrial park. As for B and T’s proposal to block ‘dual use’ technology transfers to China, the Indian government has openly rejected that line of unreason by calling on countries to accelerate technology transfers. ‘B and T’ and the entire crowd of ‘armchair war-mongers’ at the Council on Foreign Relations (CFR) have misread the most basic economic developments of our time. US economic growth is becoming increasingly dependent on large-scale, long-term foreign capital inflows from ‘emerging economies’ – especially China! Developing Asian nations accounted for $440 billion in outward investment, greater than North America or Europe , as the largest source for foreign direct investment. China’s $266 billion dollars accounted for most outgoing FDI from Asia. China’s importance as a source of investment can only expand, especially through its newly-founded ‘Asian Infrastructure Investment Bank’ (AIIB) and its plans to promote the multi-billion Silk Road linking Beijing through Central Asia to European markets. China’s financial role is going to be crucial in the new BRICS (Brazil, Russia, India, China and South Africa) bank – developed to counter the IMF. Nothing that the Obama regime and its advisers from the Council on Foreign Relations have proposed can possibly ‘balance’ the rise of China, because their policies include the boycott of large-scale, long-term Chinese economic initiatives which Washington’s ‘allies’ are eager to join. Virtually all have rushed to sign up with the AIIB leaving a sour-faced Obama Administration totally isolated. The Council on Foreign Relations’ proposal for Obama to form anti-Chinese ‘networks with its allies’ is pointless when such hostile ‘networks’ are clearly not going to undermine their most lucrative economic deals with China. After running through a laundry list of hostile policies toward China, based on a strategy of escalating military encirclement, ‘B and T’ conclude their essay with a bizarre call for Washington to “energize high level diplomacy with Beijing” and do “everything it can to avoid a confrontation with China”. This piece of ‘expert’ idiocy could only have been written by a former lecturer from the Harvard Kennedy School. Policies designed to surround China with US military installations and naval vessels, threaten China’s vital maritime routes. Measures to restrict the sale of ‘dual use’ (civilian) technology and efforts to build hostile regional networks and military partnerships are hardly conducive to ‘energizing high level diplomacy with Beijing. ‘B and T’s proposals and Obama’s policies are designed to confront, provoke and undermine China. That is one very obvious reason why China pursues such favorable economic agreements with its neighbors. ‘B and T’ policy proposals are doomed to fail because the US has not and cannot match China’s robust economic growth. Washington cannot compete with Beijing’s open and flexible large-scale economic agreements with all Asian countries (except the US vassal Japan). Most Asian powers have rejected the ideological message peddled by the Obama Administration that China is a danger. They see China as a partner, a source of capital and easy financing for vital projects without the onerous ‘conditions’ that the US controlled IMF imposes. They are not interested in big, wasteful spending on costly weapons systems pushed by US war industries and which have no productive value. If one were to propose a realistic and reasonable ‘US Grand Strategy toward China’ one would have to start by shedding all the false assumptions and bellicose proposals that have been put forth by the CFR and the authors of the Report under review. First and foremost, the US would have to give up its self-appointed role as global policeman, reallocate its bloated Pentagon budget to finance vital domestic economic development, while rebalancing the US economy away from Wall Street speculation in the FIRE (finance, insurance real estate) sector, to producing goods, providing quality services and financing long-overdue infrastructure development projects. Secondly, Washington would have to expand and promote long-term, large-scale exports of its advanced technology to compensate for the loss of low value exports. Thirdly, it would join with China in its new infrastructure bank, securing contracts via aid packages. Washington would have to look at China’s export of capital as an opportunity to improve the US’s deteriorating infrastructure. Washington would have to increase and expand its cyber-technical ties with China via joint ventures. Washington would need to replace its military bases surrounding China with industrial parks, commercial ports and regional ‘Silicon Valleys’ and promote co-operative ventures that allow the US to ride the wave of Chinese dynamism. Since the US cannot (and should not) curtail or compete with China’s growth it should join them and share it. The US should not attempt to block China’s growth and expansion; it should assist and share in its ascendancy, especially in the face of great global climate and energy challenges. Washington is much more likely to strengthen its Asian – Pacific partnership and succeed in its diplomacy if it replaced its military posturing with robust economic growth. James Petras latest books include: James Petras and Henry Veltmeyer (2014), Extractive Imperialism in the Americas: Capitalism’s New Frontier, published by Brill (Leiden/Boston) (Studies in Critical Social Sciences Series). James Petras (2014), The Politics of Empire: The US, Israel and the Middle East, published by Clarity Press, Atlanta.